Do you have a revolutionary Drag & Drop WordPress Theme? Of course that was way back then. Maybe, one might imagine, if we could use all the power of supercomputers we could figure out and predict revolutions (political, social, or technological). Back in 2011, some folks tried creating metrics and using computers to create the kinds of models that could have predicted Libya and Egypt. Others had some nominal success. But in the end, the analysis demonstrated that while computers were pretty good at looking backwards, they were significantly challenged when looking forward. And if supercomputers can’t do it, is it likely that humans can do it? I don’t think so. I don’t think people are great at predicting revolutions. But wait, what about Steve Jobs? Nineteen seconds into his iPhone product launch, Steve Jobs predicted the revolution that would soon follow. Right? But before you go assuming you’re the next Steve Jobs, let me highlight a few things. 1. First, start with this fact: You’re not Steve Jobs. No one has ever gotten you guys confused. 2. 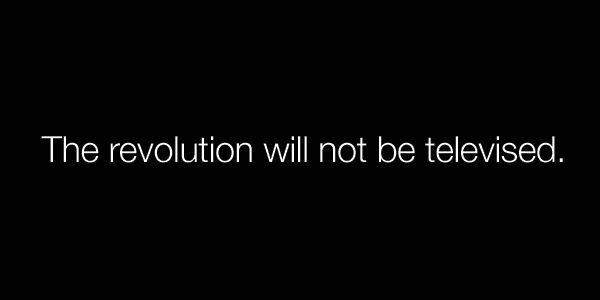 Second, notice that the revolution he was talking about was a UI revolution. Not the massive revolution that happened. 3. Third, even as he spoke of a revolutionary UI, did you catch how long it took to get there? Years. Of Research. How do you know if you have a revolutionary product? So how do you know if you’re building the next revolutionary product – like the next iPhone? Well I want to tell you the single way we’ve come to use the term when it comes to wars, cultural movements, and even product launches. Ready for it? It’s a pretty simple formula. Release the product. Watch and wait. If it totally transforms everything, then call it revolutionary. Is this a big rant? Yes. Yes, I forgot to open my <rant> tag at the top. But you’ll excuse me if I get a bit frustrated when I get an email in my inbox that announces the next revolutionary drag & drop WordPress product. It’s going to revolutionize the way people design web sites. But wait, the email I got is from people who launched a different revolutionary product a bit ago, and then decided that they needed to start a new project to create an even newer revolution! Did you catch that? It’s called the “misuse of the term ‘revolutionary'”. Ok, trust me, I know that I get a lot of traffic because of my review of drag & drop WordPress themes. I know that. But I never called them revolutionary. So I want to go on record here with something that I’ve been trying to formulate for a while and today it finally landed clearly in my mind. I’ll start by saying this: I love iThemes Builder and Headway’s theme. This isn’t about them. Because they provide not only a theme, but a fantastic company behind each product that works at helping people design and build their sites. They’re both known for their support. So the rest of my statements don’t really apply to them. If you read the copy on most drag & drop theme builders, they’re all suggesting the same thing: that you can now build sites on your own – without any help. Now step back and think about that for a second. Our new house is being built right now. It’s going to provide me with protection from the weather, a place to find comfort, and the main place where I’ll generate revenue. So how come I can’t find a home-building kit to create one without any help? The other day I took a picture of my watch. Most of us wear watches. They provide valuable data just at the right time and help us make decisions. So how come I can’t find a watch-building kit to create one without any help? Do you know what the web looks like when people can do it on their own, without any understanding of what they’re doing? I mean, this wouldn’t be an issue if the only thing people were putting on the web was their online journals, right? I mean, in that case we could all have funky looking blogs and no one would care. The right goal isn’t to perfect a creation tool, a kit, if you will, that lets you do things on your own. The right goal is to help you create a site that delivers the exact value that you need. You’re creating a site for a reason. And that reason may be transactionally-oriented. It may be relationally-oriented. It may be informationally-oriented. But in every one of those cases, it will still have a goal. And the goal shouldn’t be that you can do it all alone – especially if you’re not an expert. Instead, the goal should be that others, experts, can use them to get you online as fast as possible while leaving you a site you can manage on your own. And that’s why I really love iThemes Builder and Headway. And that’s also why I’m ignoring this next drag & drop WordPress Revolution that appears later this month.